The club was established in 1959 and was initially a Sunday League side known as Woolwich Town and had a decent amount of success. The'd not move into Saturday football until 1991 when they joined the Spartan League. Starting in Division 2, 9th place in their first season was good enough for promotion, thanks to restructuring. They coped with the step up well and by 1995 had earned promotion to the Premier Division, having finished as runners-up to Tottenham Wine. They spent a single season in the Spartan Premier before moving to the Kent League. 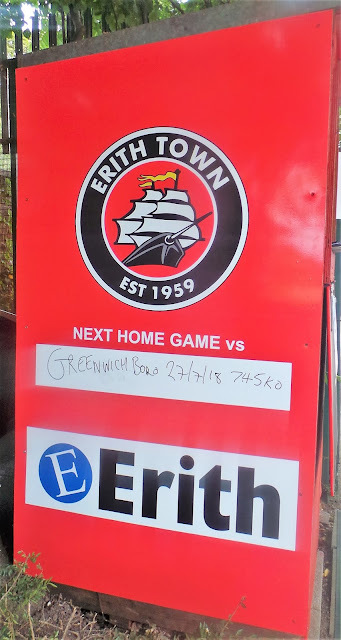 In 1997 they adopted the name Erith Town. 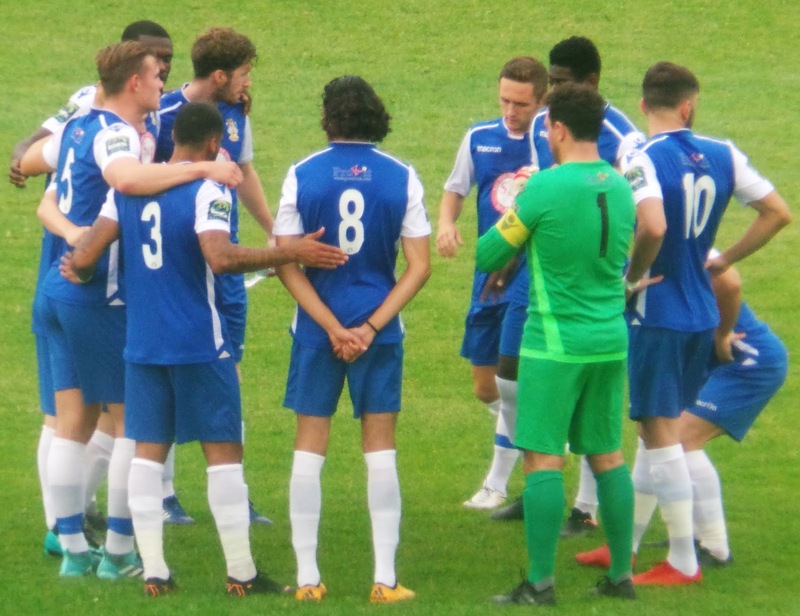 They've been in the Kent League (now called the Southern Counties East League) all of that time, finishes ranging from two 3rd place finishes in 2013 and 2014 to a 19th place finish in 1997. 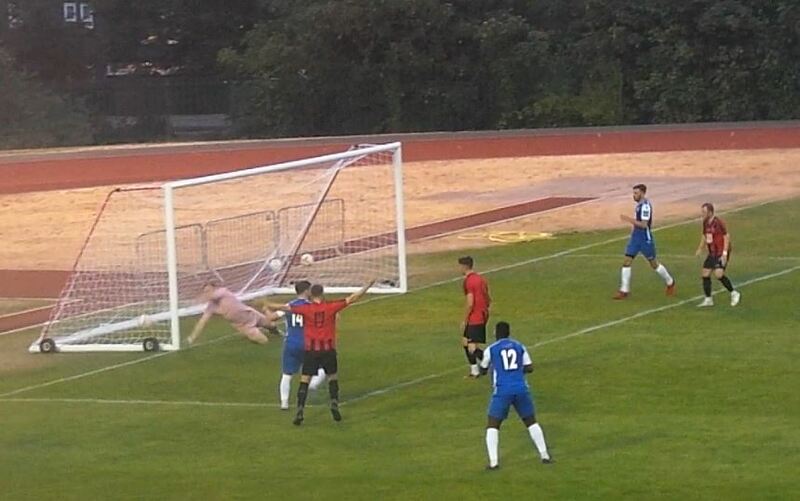 Erith Town have been regular participants in the FA competitions all of that time. 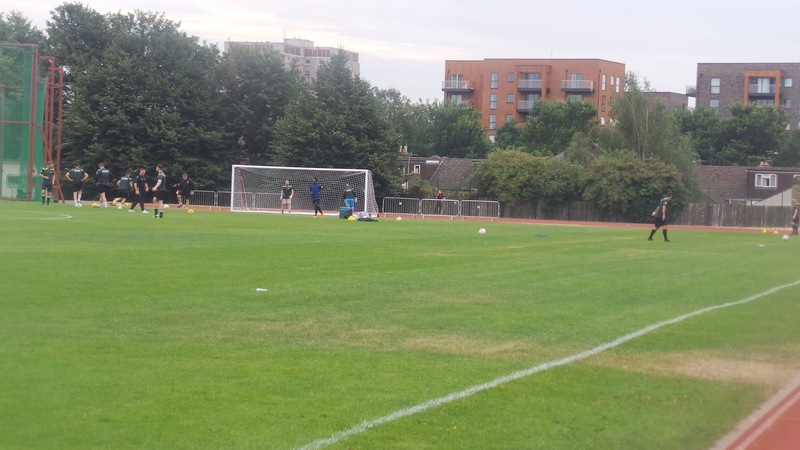 In the FA Cup they've reached the 2nd Qualifying Round on three occasions, most recently losing 5-0 at Cray Wanderers in 2011. The FA Vase 3rd Round was reached in 2013 - Lingfield & Hartley Wintney were beaten before they lost out to Norwich United. Local cup wins include the Kent Senior Trophy in 2011, beating Tunbridge Wells 3-1 in a final played at Welling United. 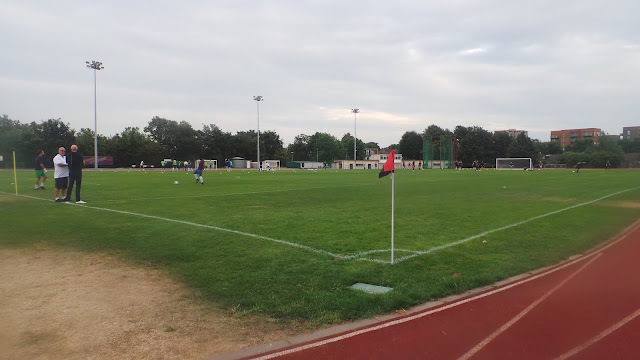 The best ever attendance of 325 came for a friendly against Carshalton whilst the biggest win of 9-0 against Sporting Bengal United came on 15th January 2011. 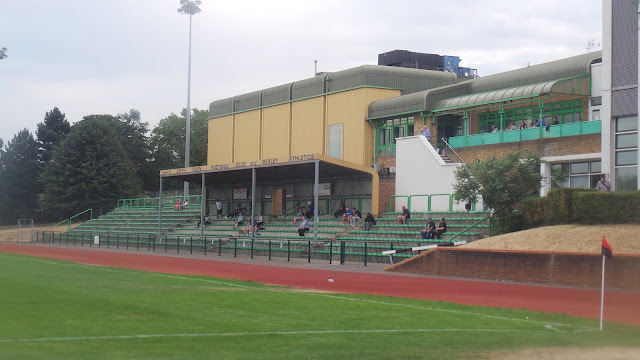 Former grounds include Woolwich Barracks (until 1991), Harrow Meadow (groundshare with Greenwich Borough 1991-95, 1998-99), Bayliss Avenue (groundshare with Thamesmead Town (2008-09) and Badgers Sports Ground (groundshare with Cray Valley PM 2013-16) and Oakwood (groundshare with VCD Athletic 2016-18). 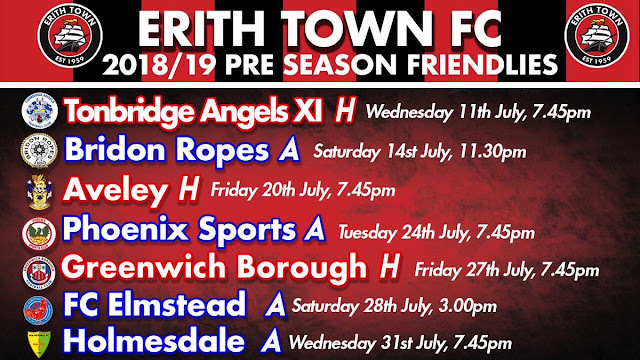 They will start this season back at Erith Stadium for a third spell, having played there between 1995-98 and 1999-2008. For the penultimate game of my week off, I was hoping to do one by public transport, having driven to all of my pre-season games so far. 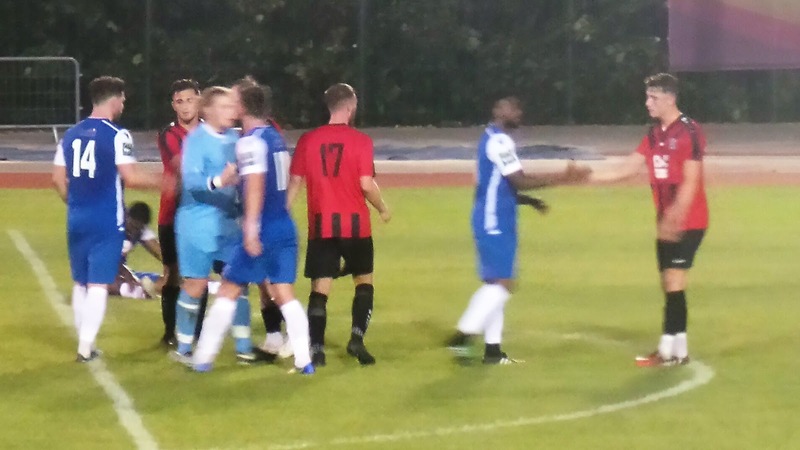 Erith Town came up trumps for their friendly game against Aveley. With them having moved back home to Erith Stadium, it was a rare opportunity for me to do a new ground within the London area that was included on a TFL travelcard. TFL is about the only train company who do affordable trains without having to pay well in advance. They are also the only ones that make midweek matches viable - doing a game in Birmingham on a midweek night is impossible seeing as the last train back from Birmingham to Wycombe is at 9.15. It wasn't the greatest stadium as it had a running track and the town of Erith was not great for pubs, but they seemed a decent club, having a reliable and informative Twitter and website. For once, I'd had a good nights sleep on the day of the game, waking at 10am. It was a bit of a rush with my blogs to catch up on, especially with other jobs to catch up on. I had a bath and a change of clothes before I completed my Retford blog from Tuesday. I also took my Aunt's boxer dog out for a walk, before coming back and updating my Walsall blog. It gave me a good opportunity to catch up on my YouTube videos, though a patchy internet connection frustrated me. 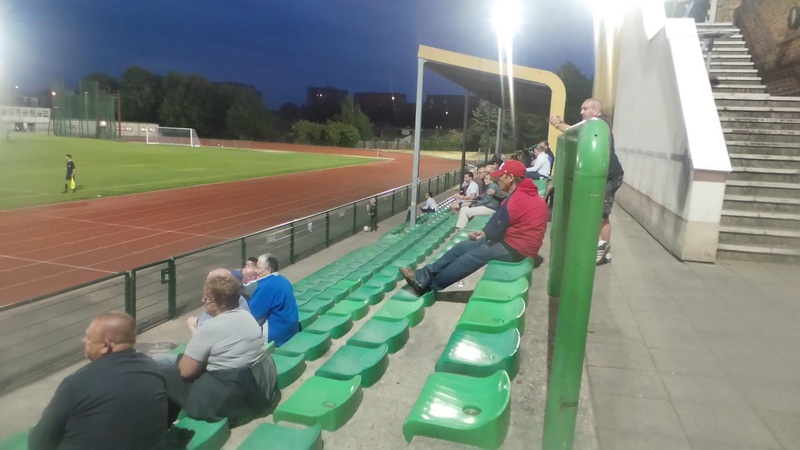 I even had time to type out my Cheadle Heath Nomads blog from last night, meaning that aside from my research for tomorrow's groundhop, I was all caught up. I left home at 2.40, parking up at Amersham and getting the 3.10 train into London. Changes at Harrow on The Hill, Finchley Road and London Bridge taken, before my eventual destination of Bexleyheath. 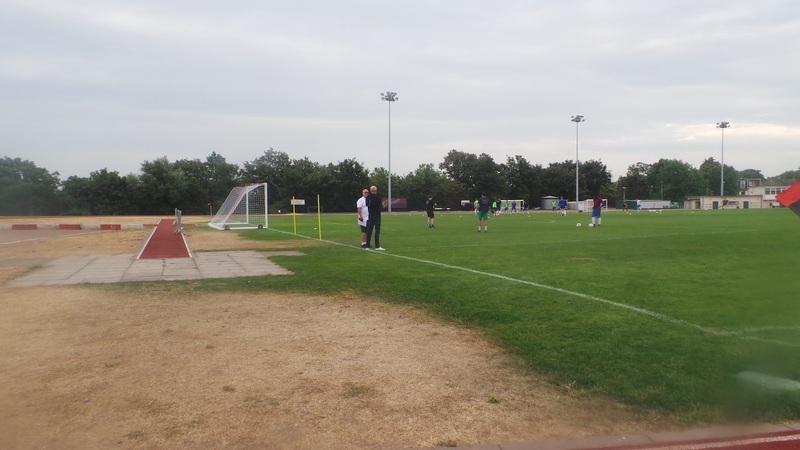 The journey time was well utilised researching club histories for future blogs. The last leg of the journey was not the most pleasant on a busy and hot Southeastern train as it had to keep stopping at red lights, preventing much-needed ventilation. Unavoidable obviously, but it made us a tad late, eventually getting to our destination at 5. My first stop had already been planned. 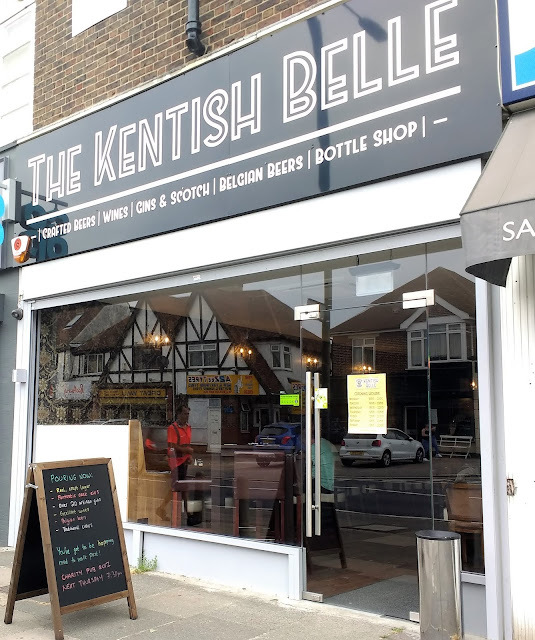 I’d spotted an excellent Micropub called The Kentish Belle. Here I had two lovely ciders - Malvern Magic and Ross on Wye Broome Farm. I even enrolled on their loyalty scheme, though it’s a shame that a return will be unlikely as it is so far away. I would ideally love to return though and so gave up my Wetherspoons tick as further incentive to come back. I ordered a meal - curry samosas and salt and chilli chips from the local Chinese takeaway. 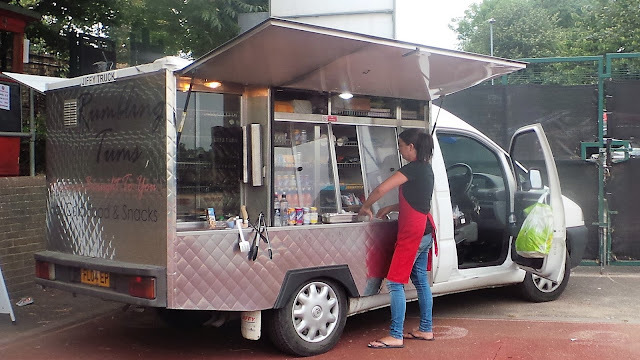 Food that’s easy to eat on the move as I’d decided to walk to Erith rather than save 15 minutes by public transport. It was a fair walk, longer than I expected but I was there in plenty of time for kick off. I got a decent spot on the viewing gallery after paying a fiver to get in and waited for kick off. I got myself the best spot that I could in an athletics stadium, up in the viewing gallery. The on-pitch fare started with Aveley playing some neat stuff and carving out some chances but soon descended into two sides aimlessly kicking the ball around. Aveley started to take control again towards the end of the half, their number 9 getting away from the defence and placing a shot just wide. 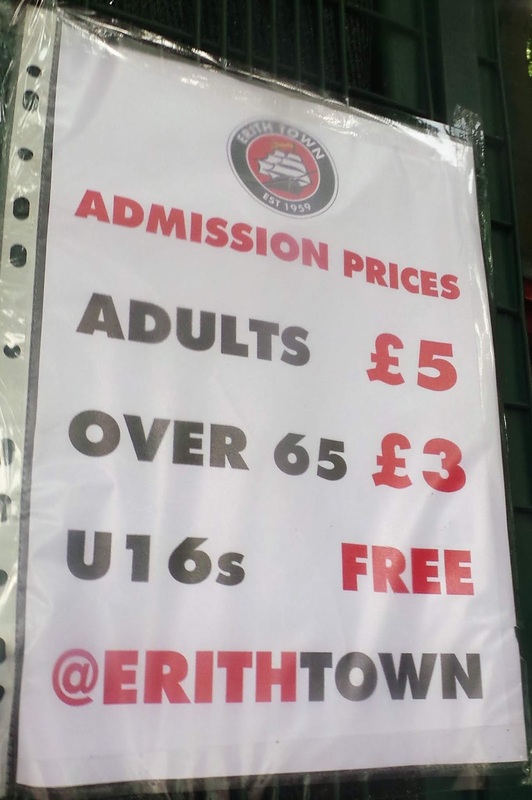 Generally, though, it was disappointing fare, even if Erith Town ended the half strongly. The second half saw plenty of endeavour but not the greatest end product. 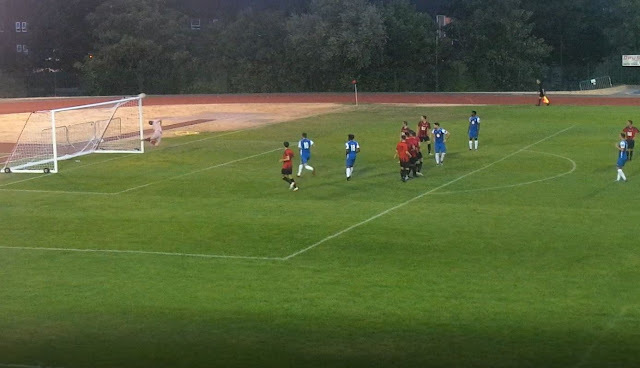 The visitors eventually took the lead on 63 minutes, a long ball finding Antonio Martin who finished confidently past the home keeper. It was Aveley who continued to have the better of the game, shaving the bar from a long-range effort and a trialist smashing a free kick against the bar. That was really it for major chances and despite Erith Town trying their best on the break, Aveley always looked in control. It was an attendance of 80 that saw the game and although it wasn’t the best, I was glad there was a goal. 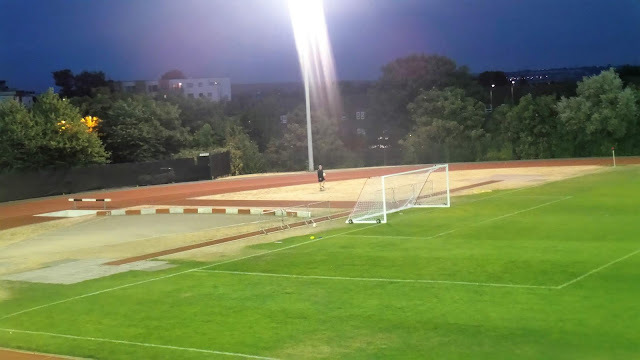 The game finished around 9.40 and I headed back towards town. I wanted to go to Morrisons and got some chicken and a drink. From there I got to the station, getting a train back into London at around 10.10. For once the service went smoothly, with trains to Amersham every half an hour, I’ll invariably miss one by a couple of minutes and have a long wait. This time though, it was to be just 3 minutes wait after a quick dash across the platform. It meant that I got back to Amersham around midnight, having had a decent day. I managed to upload my blog on the night, having typed it on my journey home. 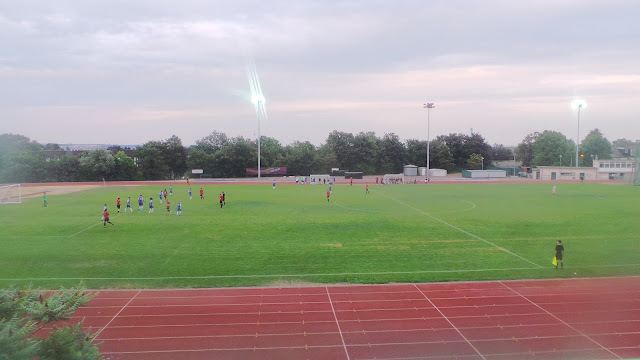 ERITH STADIUM is an athletics stadium, which is not ideal for watching football, but it's not as bad as I thought. The distance from the viewing area to the pitch is not too far and if you stand up on the viewing gallery outside the bar, you can get a great view. There's room for around 50 up there at a push and a number of chairs are provided. 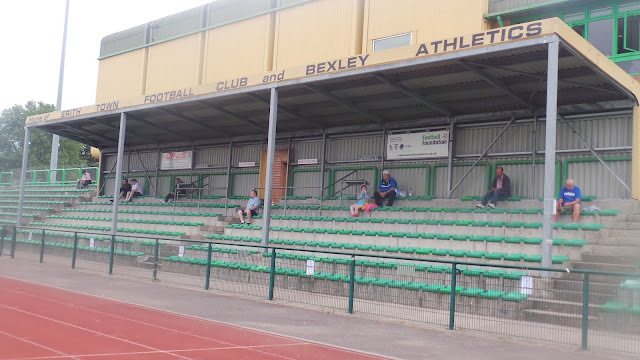 There's seating below for around 500, plus standing for another couple of hundred, with all the accommodation being on one side of the pitch. 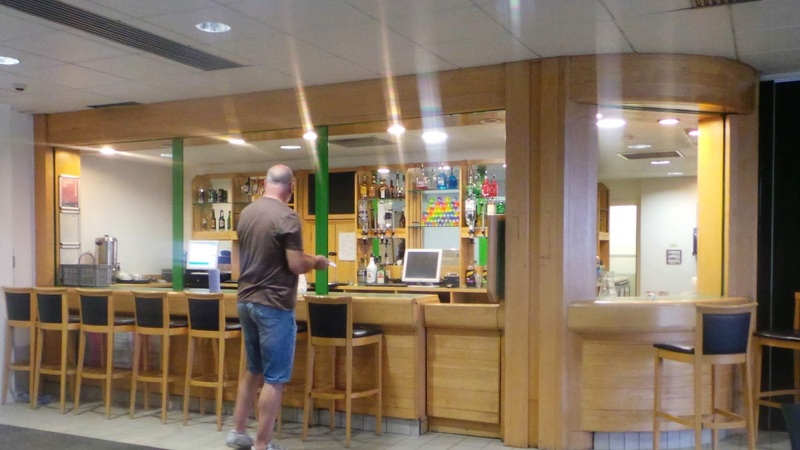 There's basic food and drink facilities at the ground, plus the town is just over 10 minutes walk and has a decent range of takeaways.